Last month, Nunes announced at a press conference that he had evidence Trump’s transition team had been improperly surveilled by the federal government—a statement he made without presenting evidence, and one that appeared to support Donald Trump’s baseless claim that President Obama wiretapped Trump Tower. It was later reported that Nunes’s source was within the White House, and Nunes had a secret meeting there before making his announcement to the press. He did not consult the Intelligence Committee’s ranking Democrat before the meeting or making the announcement. He also abruptly canceled a hearing the day former acting Attorney General Sally Yates was supposed to testify. 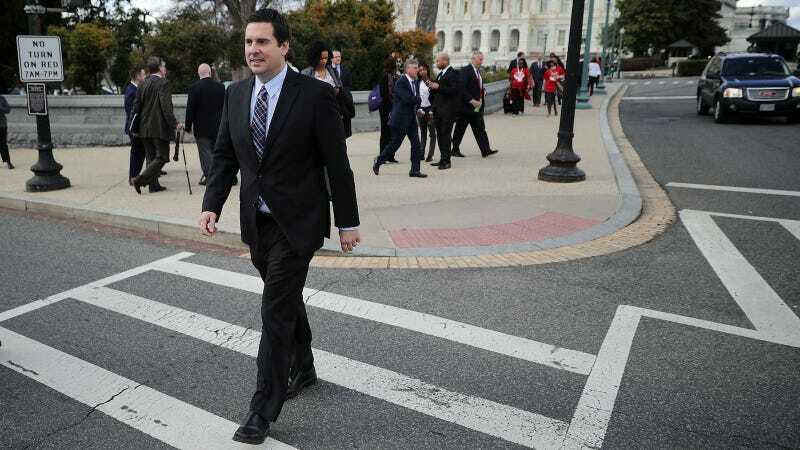 Organizations like Citizens for Responsibility, MoveOn.org, and Ethics and Democracy 21 demanded that the Office of Congressional Ethics investigate Nunes’s actions. Several leftwing activist groups have filed accusations against me with the Office of Congressional Ethics. The charges are entirely false and politically motivated, and are being leveled just as the American people are beginning to learn the truth about the improper unmasking of the identities of U.S. citizens and other abuses of power. Despite the baselessness of the charges, I believe it is in the best interests of the House Intelligence Committee and the Congress for me to have Representative Mike Conaway, with assistance from Representatives Trey Gowdy and Tom Rooney, temporarily take charge of the Committee’s Russia investigation while the House Ethics Committee looks into this matter. Nunes, who worked on Trump’s transition team, is not the first Trump-affiliated Republican to step down in the Russia investigation. Former National Security Advisor Michael Flynn was forced to resign weeks into the presidency for misleading officials about conversations he had with a Russian ambassador. Attorney General Jeff Sessions recused himself from the Russia investigation after it was discovered he had conversations with Russian officials during the campaign but he had denied having done so during his confirmation hearings. House Minority Leader Nancy Pelosi is hopeful that Nunes’s recusal will lead to a less biased investigation into Russia’s alleged interference with the US election. “I did have plenty reason to think that [Nunes] should not be in that role, both because of his role in the Trump transition and because of his erratic and bizarre behavior as chairman of the committee,” she said on Thursday.